The Presbytery of Sheppards and Lapsley is now raising funds to build the first of two schools in areas near Kananga. 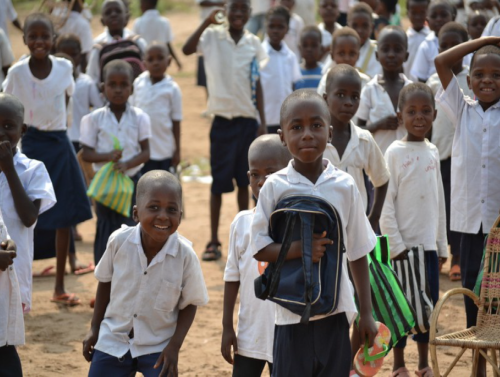 These kids at Bupole (near Kananga) need a new school building! The cost will be $80,000 each. Now these students sit on the ground, bring a chair, or use a few desks that are available. They have been meeting outside under a pole and thatch structure for five years. Over 200 students attend the Bupole school. We would ask for your support. Hopefully, we can raise enough money to get them in a building with sanitary latrines before next school year. We are happy to report fund raising for Bupole School, Nganza Presbytery of the CPC, is completed. Construction will begin very soon. Thanks be to God. We are now moving forward to raise funds for the Baolongo School in Tshibashi Presbytery. We still need your help. Please consider donating. This school meets in a dilapitated mud brick building. The new school will serve elementary students in the morning and secondary students in the afternoon. Our funds will be channeled through Medical Benevolence Foundation in cooperation with Build Congo Schools.